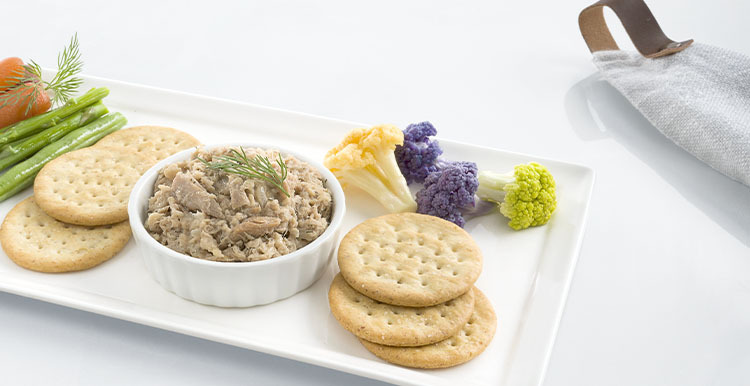 This flavor-packed kit combines premium tuna salad in a delicious dill and Greek yogurt dressing paired with crispy wheat crackers for the ultimate classic that can go wherever life takes you! CONTAINS: EGG, MILK, SOY, TUNA, WHEAT. Ingredients: TUNA SALAD (TUNA [CHUNK LIGHT TUNA, WATER, VEGETABLE BROTH, SALT], LIGHT MAYONNAISE DRESSING [WATER, SOYBEAN OIL, DISTILLED VINEGAR, MODIFIED FOOD STARCH, EGG YOLKS, SALT], GREEK YOGURT [NONFAT MILK, MILK PROTEIN CONCENTRATE, CREAM, PECTIN, ENZYMES, CULTURES], TEXTURED SOY FLOUR, GLUCONO DELTA LACTONE, WATER, MALTODEXTRIN, SUGAR, AND LESS THAN 2% OF DRIED ONION, WHEY, DILL, SALT, GARLIC POWDER, BLACK PEPPER), CRACKERS (ENRICHED FLOUR [WHEAT FLOUR, NIACIN, REDUCED IRON, THIAMIN MONONITRATE, RIBOFLAVIN, FOLIC ACID], CANOLA OIL, WHOLE WHEAT FLOUR, SUGAR, AND 2% OR LESS OF CORN SYRUP, SALT, MALT SYRUP, BAKING SODA, BUTTER, ONION POWDER, SOY LECITHIN, MONOCALCIUM PHOSPHATE). Nutrients: TUNA SALAD (TUNA [CHUNK LIGHT TUNA, WATER, VEGETABLE BROTH, SALT], LIGHT MAYONNAISE DRESSING [WATER, SOYBEAN OIL, DISTILLED VINEGAR, MODIFIED FOOD STARCH, EGG YOLKS, SALT], GREEK YOGURT [NONFAT MILK, MILK PROTEIN CONCENTRATE, CREAM, PECTIN, ENZYMES, CULTURES], TEXTURED SOY FLOUR, GLUCONO DELTA LACTONE, WATER, MALTODEXTRIN, SUGAR, AND LESS THAN 2% OF DRIED ONION, WHEY, DILL, SALT, GARLIC POWDER, BLACK PEPPER), CRACKERS (ENRICHED FLOUR [WHEAT FLOUR, NIACIN, REDUCED IRON, THIAMIN MONONITRATE, RIBOFLAVIN, FOLIC ACID], CANOLA OIL, WHOLE WHEAT FLOUR, SUGAR, AND 2% OR LESS OF CORN SYRUP, SALT, MALT SYRUP, BAKING SODA, BUTTER, ONION POWDER, SOY LECITHIN, MONOCALCIUM PHOSPHATE).